mumbai is home to little over 20 million people, and its metropolitan area is largely situated on a narrow peninsula which juts into the indian ocean. 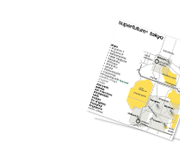 you could say there's a lack of room for expansion of any kind and that certainly counts for the airport which is located smack in the middle of suburban housing estates. 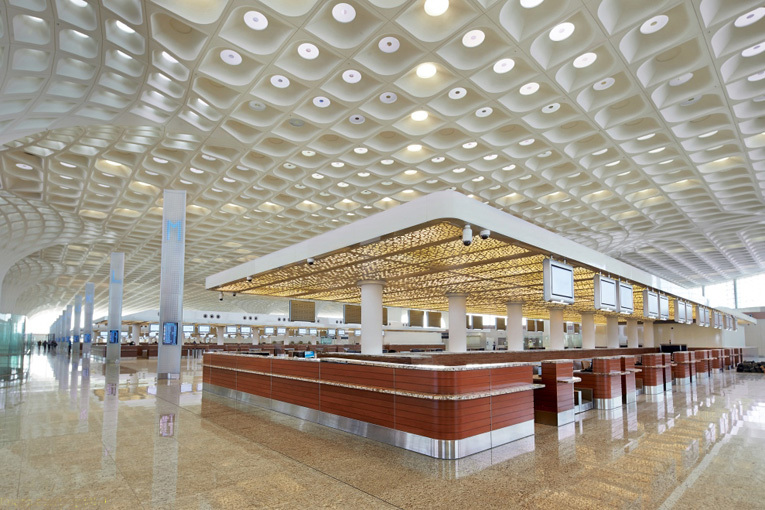 chhatrapati shivaji international airport used to be india's busiest but has lost a lot of traffic in recent years to its rival delhi airport due to severe capacity constraints. 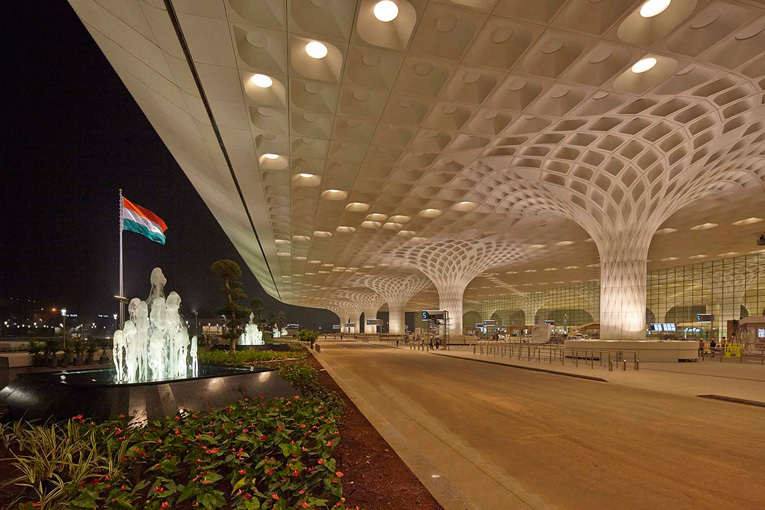 aiming to regain the title of the country's premier air hub, mumbai has struck back with the recent opening of terminal 2, a state-of-the-art structure by chicago-based architecture practice skidmore, owings & merrill. 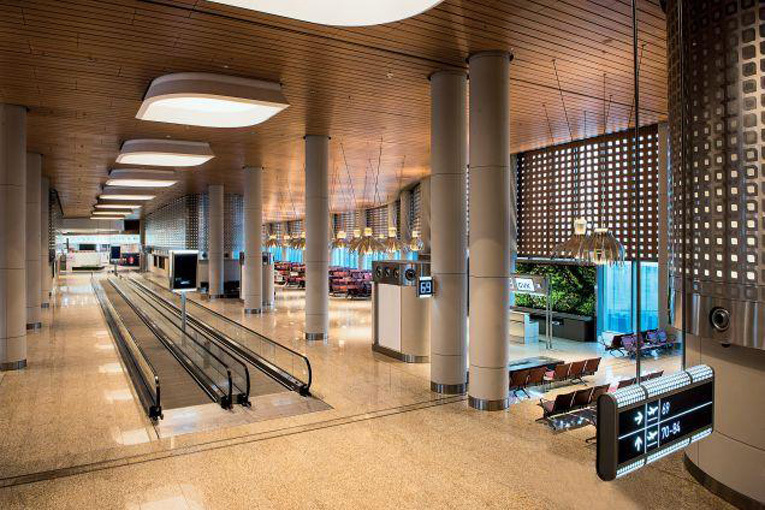 it's a four-level integrated terminal with a total area of over 439,000 sqm. 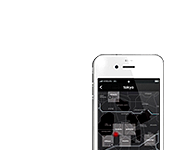 [4,725,357 sq.ft. ], and includes new taxiways and apron areas for aircraft parking, and is designed to handle up to 40 million passengers annually. terminal 2 combines international and domestic passenger services under one roof, optimizing terminal operations and reducing passenger walking distances. interestingly, it's inspired by the form of traditional Indian pavilions, the four-story terminal stacks a grand headhouse, or central processing podium, on top of highly adaptable and modular concourses below. rather than compartmentalizing terminal functions, three symmetrical concourses radiate outwards from a central processing core and are therefore easily reconfigured to swing between serving domestic flights or international flights. 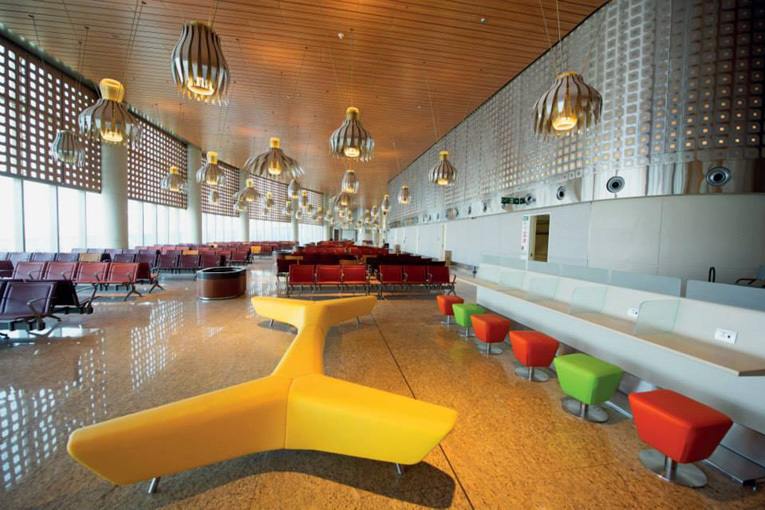 terminal 2 features 8 check-in islands, 60 emigration and 72 immigration counters, 52 boarding bridges, and is also one of the first indian airports fully capable of handling the airbus a380, the planet's biggest commercial airplane. the opening of terminal 2 is very well timed as the indian government has just lifted the ban on the deployment of these aircraft by foreign airlines on flights to india. constructing the building was no mean feat as the existing terminal had to be demolished while traffic operations had to be continued at the same time. 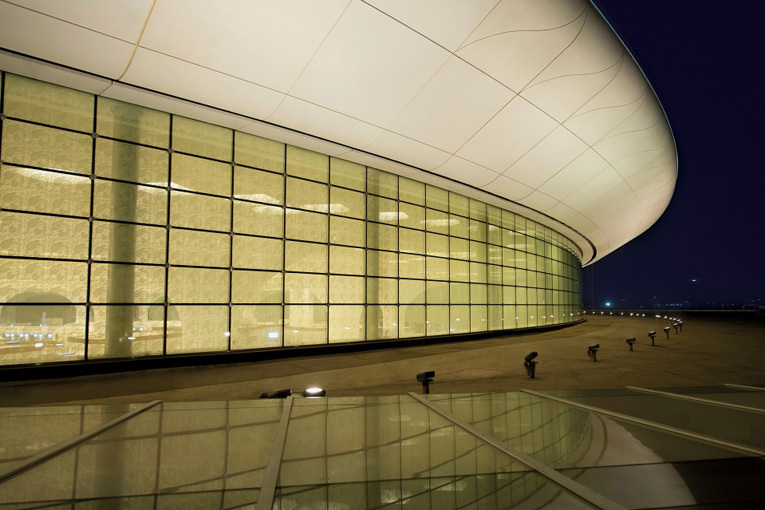 the new buiding is considered to be india's largest and most complex infrastructural project ever accomplished and as such the building is also designated as a major cultural statement. 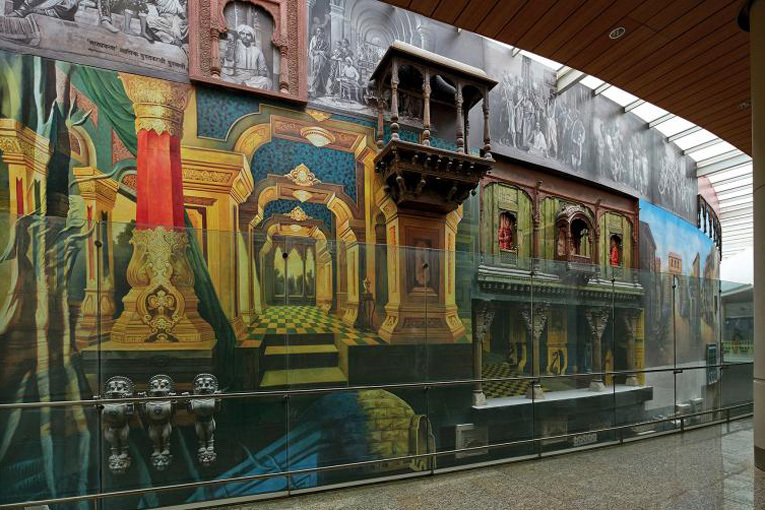 as said, it's not only inspired by indian architecture but its interior is also embellished with thousands of cultural artefacts and paintings from across the country, including colourful murals depicting portraits of some of bollywood's biggest stars. location: chhatrapati shivaji international airport, sahar elevated road [santa cruz].